On October 5, 2010, Huatulco’s Eco-archeology park opened to the east of Tangolunda Bay near Copalita. It provides a unique experience of pre-Columbian life on the Oaxacan Coast as it existed well before the Spanish conquest of Mexico. The park, located just past the turnoff for Playa La Bocana, consists of over 81 hectares (200 acres), including a museum and trails leading to recently excavated archeological sites, primarily undisturbed conservation areas, and magnificent views of the coastline. Developed by FONATUR (the Mexican government foundation for promoting tourism) and INAH (National Institute of Anthropology and History), the park offers residents and tourists alike an informative and visually inspiring experience. The museum displays archeological finds from excavations in the State of Oaxaca, including from this site which overlooks the mouth of the Copalita River. The workmanship and artistic beauty of many of the pieces are stunning. Numerous items are in such pristine condition that it is difficult to accept that they are originals rather than replicas. The 2010 opening of the museum and park culminated more than a decade of work by anthropologists under the direction of Raúl Matadamas Díaz, a researcher at INAH with whom we met recently for an update about the archeology of Huatulco. At the time the museum opened, the artifacts discovered in Copalita had not been fully investigated. For this reason, the information provided to visitors was not very specific (and also all the signs and available literature were written in Spanish, making a visit there somewhat of a challenge for English-speaking tourists). Since that time, the artifacts previously discovered (including the ones on display) were studied carefully, and additional areas of the site were excavated, with recovery of important finds for the anthropologists. Even so, some questions have still not been fully answered, including the ethnic background of residents during different periods of occupation of the site, where the residents traveled from to live here in Huatulco, what kind of commerce they had with other populated areas elsewhere in Mexico, their form of governance, and their relations with powerful rulers nearby. Two years after the park opened to the public, in October 2012, INAH announced the discovery at the Copalita site of the sepulcher of a person who appeared to have been the ruler of this place 1300 years ago. His tomb was surrounded by remains of 38 other individuals, some of whom had lived in the same era. Near his skeleton were found a collar of 5 pieces of jade (a material not naturally found in this area), objects for religious offerings, a ruler’s staff, and pieces of vases, jewelry, and chest decorations. The human remains discovered at the site were initially removed to INAH’s Oaxaca facility for analysis, but the bones which had lasted centuries in Huatulco’s humid climate did not tolerate the drier air and cooler temperatures of Oaxaca city and were returned to a building within 100 feet of the museum at the Eco-archeological park. An INAH archeologist continues to study them at this location, occasionally sending minuscule samples to Mexico City for DNA analysis. By comparing the DNA from these samples with DNA from populations in other places in Oaxaca, the Isthmus, and Chiapas, INAH researchers hope to be able to clarify the migration of ancient populations in southern Mexico. The study of these artifacts has already resulted in a much improved understanding of the pre-Hispanic residents of Huatulco – their cultural heritage, body size and strength, diet, longevity, health problems, occupations, funeral practices, and many other details. Prior to this discovery, the artifacts retrieved from the site had belonged to non-elite residents, their homes, and daily activities. According to a written summary prepared by INAH this year as a source for this article, the site was occupied more than 2,500 years ago, around the same time that Monte Alban (a much more well-known and extensive archeological site near the city of Oaxaca) was flourishing. Even at that time (500 BC), the community had a system of writing, a well-established calendar, and a strong political, socioeconomic, and religious organization. The community numbered at least 3,000 people. They had a remarkably advanced understanding of construction, especially of types of cement suitable for building in muddy areas subject to inundation. Visitors to the site will see the remains of a large temple (only part of which has been restored), a central plaza, a ball field, and walls, canals, and passageways dating from this time. From the numerous shells and fish bones found, it is known that the inhabitants engaged in fishing, hunting, making of fish nets, and dyeing of textiles from the pigment found in local purple snails. Agriculture was not prominent, except possibly for family gardens. The site went through a sequence of abandonments and repopulation. By the year 500 AD, the population was very prosperous and well governed. It specialized in making ceramic utensils, producing cotton products, sewing nets for catching and transporting fish and other seafood, navigation, and ship building. The various types of stone materials found from this era suggest that the inhabitants either came from wide areas of Chiapas and the central valley of Oaxaca, or they had extensive commerce with these areas. At the site in Copalita were found gray obsidian from the volcano near Orizaba, white Mayan ceramics from east of here, and tools for grinding basalt (a kind of rock not found naturally here). As a result, the anthropologists are still uncertain about the cultural heritage of the residents at that time, but it was probably a multi-ethnic community of Mixtecs, Zapotecs, Zoques, Mixes, and predecessors of ethnic groups that now inhabit the Isthmus of Tehuantepec. By the year 800 AD, the site had been essentially abandoned. The buildings which were discovered dating prior to that time had been covered with 1.3 meters of dirt and sediments, indicating that the river changed its course or that there were successive inundations of floods separated by droughts. The sediments included parts of trees, rocks, animals, houses, and cooking utensils. The archeologists speculate that the community was forced to flee to higher altitudes or that the economic activities related to clay, snails, and fishing became untenable. The site was again populated by Mixtecs around 1100 AD. This period is well understood from other archeological sites in Oaxaca and from writings of Spanish explorers who conquered the area hundreds of years later. In the 12th Century, the Mixtec population was ruled by Ocho Venado (Deer Man number 8), who successfully conquered and populated large portions of southern Mexico. The Mixtec population remained there until it was decimated by the conquistadors, and from then on the Copalita site was no longer an important population center. By 1540, Huatulco was entirely a major Spanish port. Currently, fifteen archeological sites are known in the various bays of Huatulco. Major unexplored ruins exist in the heights overlooking Chahúe Bay and in the wetlands of Cacaluta Bay. Unfortunately, the development of the bays for tourism has already obliterated several of the sites – and current plans for development of Cacaluta into a new hotel complex are likely to prevent study in that area. INAH intends to revise the displays at the museum to include some of the more recent discoveries and also explanations of the current research knowledge. Most of the artifacts currently on display at the museum will be replaced with more recently discovered pieces, including large vases, figurines, and personal and ceremonial decorations made of turquoise and jade. The planned update of the museum includes signs in English as well as Spanish, plus a video whose soundtrack will include native speakers of indigenous languages spoken by the early residents of this site. We were privileged to see some of the pieces at the INAH offices in Oaxaca and to hear details of the museum renovation at the INAH office in Bocana Copalita. Look for an article in “The Eye” next year describing the updated museum. 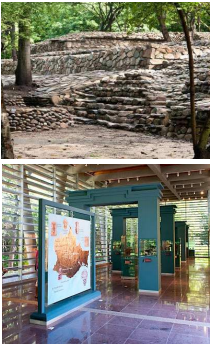 Also projected for the future is the release of a Spanish-language booklet describing the pre-Hispanic history of all of Huatulco, written by Raúl Matadamas and Sandra Ramirez and planned to be on sale beginning in May 2015 at the Copalita Eco-archeological park, at airports, and at venues in La Crucecita where magazines and books are sold. It is entitled “Antes de Ocho Venado y despues de los Pirates: Arqueología e Historia de Huatulco.” INAH archeologists are currently undertaking a new round of excavations of the Templo Mayor at Bocana Copalita. Who knows what other treasures may be found in the area?